An interactive way to develop reading skills. Children will become familiar with the alphabet, a variety of vocabulary words, syllables, sentences, and letters. 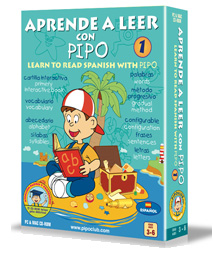 Your child will learn to read in Spanish without realizing it through play. Once the child has mastered the program a diploma can be printed out per letter! The second level of an engaging interactive technique in which the child starts learning compound syllables, perfects reading words, phrases, and improves reading comprehension. Children will become comfortable with writing sentences and even compose paragraphs, and become familiar with reading comprehension, as well as become familiar with dictations. 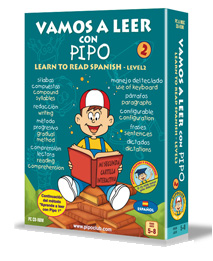 This product helps broaden childrenâ€™s imaginative capabilities while developing reading and writing skills. Your child will have the opportunity to have their story take place on different sceneries; where they can create animated characters such as a princess, a frog, and even PIPO himself. The animated character will be able to fly, travel through space, and dive. Let children create and tell their story, Let their imagination lead the way! 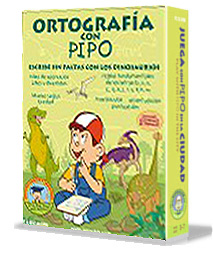 Children will learn proper spelling and grammatical form in a fun and practical way. The highest level is suitable even for adults. This activity takes place in the world of dinosaurs; they will resolve all types of spelling doubts in thousands of useful and fun exercises. Spelling is vital for development of language in children. Knowledge of writing correctly is a key factor to improve communication both written and spoken.